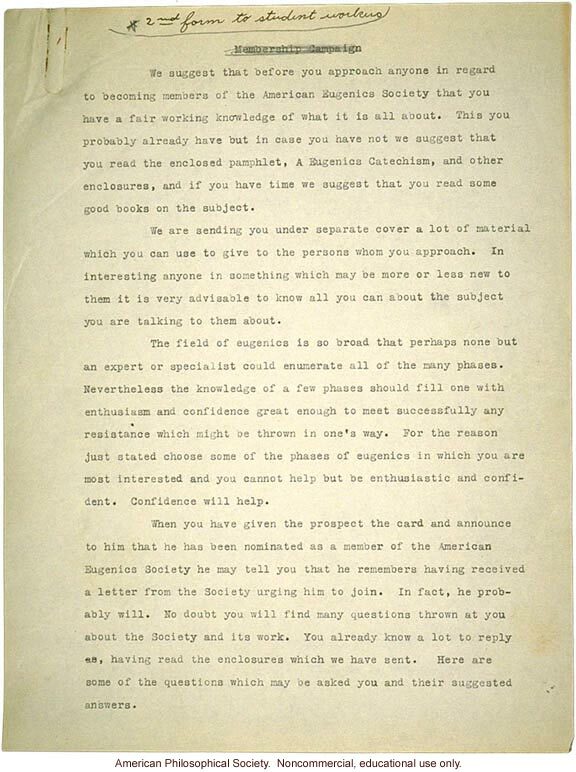 [handwritten note] 2nd form to student workers [end handwritten note] [crossed out page heading] Membership Campaign [end crossed out page heading] We suggest that before you approach anyone in regard to becoming members of the American Eugenics Society that you have a fair working knowledge of what it is all about. This you probably already have but in case you have not we suggest that you read the enclosed pamphlet, A Eugenics Catechism, and other enclosures, and if you have time we suggest that you read some good books on the subject. We are sending you under separate cover a lot of material which you can use to give to the persons whom you approach. In interesting anyone in something which may be more or less new to them it is very advisable to know all you can about the subject you are talking to them about. The field of eugenics is so broad that perhaps none but an expert or specialist could enumerate all of the many phases. Nevertheless the knowledge of a few phases should fill one with enthusiasm and confidence great enough to meet successfully any resistance which might be thrown in one's way. For the reason just stated choose some of the phases of eugenics in which you are most interested and you cannot help but be enthusiastic and confident. Confidence will help. When you have given the prospect the card and announce to him that he has been nominated as a member of the American Eugenics Society he may tell you that he remembers having received a letter from the Society urging him to join. In fact, he probably will. No doubt you will find many questions thrown at you about the Society and its work. You already know a lot to reply [illegible 2 letters], having read the enclosures which we have sent. Here are some of the questions which may be asked you and their suggested answers.